Two-room appartment for 2 - 4 people, approx 49 qm. Balcony, 3rd floor. Spacious living room with dinette, couch set (bed-couch for two), cable-TV, radio, telephone. Completely equipped kitchen line with microwave and coffee machine. Balcony with wonderful mountain vista. Double bedroom. Bathroom with shower facilities and WC. The house 'Brunnsteinblick' lies quietly bat central. Shops for the daily shopping and restaurants can easily reached by foot. Recover in our garden with sunbathing area. Parking lot at the house, possibly also a garage for Euro 4,00 per day. Ask if pets can be brought. We deliver fresh bread rolls to you daily in your appartment. We serve to you if requested an breakfast in your holiday apartment for Euro 4,00 per person. Cyclists are welcome. Lockable room to store bikes is available. Hospitality, cosy environment, recreation and experience of nature, your lasting impression of your vacation. We offer the ideal starting point. Some steps and you are amids the nature, in the middle of pleasure! 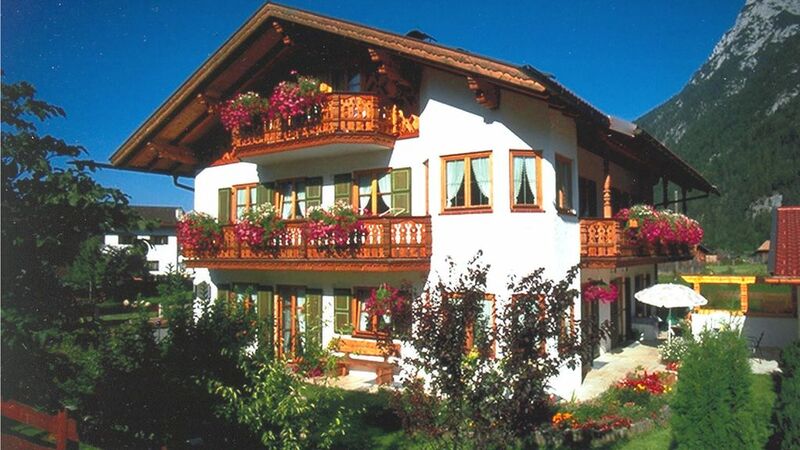 Mittenwald is an ideal place to spend your winter or summer holidays. Enjoy the good air and our hospitality. All seasons have something to offer. Hiking along the Isar river - hiking on easy mountain trails or on alpine trails in the 'Alpenwelt Karwendel'. Biking through the sunny high valley for the whole family or mountain biking. Golfing in a alpine environment - swimming in clear lakes - play tennis or minigolf. Winter hikes or cross-country skiing on well groomed tracks. Experience the Bavarian tradition.